We first saw a Win Green playhouse in a toy shop window in Thirsk about 5 years ago. It was the small Barn playhouse and it looked fabulous. When we opened Dotty Hippo we knew we wanted to include Win Green in our ranges and we have now been selling their playhouses for 3 years. We hope this guide will help you to select the right playhouse for your child. Where is Win Green made? Win Green is a British company owned by Sue and Jeff Sands who took over Win Green in 2012. The products are designed in the UK and manufactured in India by rural Indian women who are part of a government backed initiative which is helping them to gain financial freedom and to support their families. What are the playhouses made from? Win Green playhouses are made from extremely durable hand woven and hand dyed 100% cotton. The material is very strong and slightly stretchy so that it can be pulled over the playhouse frame. The embroidery on the playhouses is very detailed and colourful - it's difficult to do justice to the quality of the fabric on a photograph. Many of our customers purchase a Win Green playhouse because they have seen one in a friend's garden! Are Win Green playhouses machine washable? We do not recommend that you machine wash your Win Green playhouse, the size and weight of the fabric is not generally suitable for domestic washing machines. You can sponge clean or dry clean. The floor quilts, beanbag covers and other matching accessories are machine washable. Is the playhouse fabric fire proof? 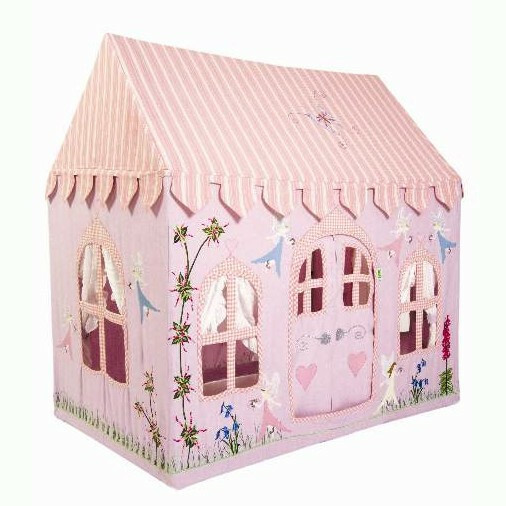 The fabric of these playhouses have been tested for flammability and adhere to the relevant European safety regulations. However as an additional safety precaution, no naked flames should be used in or near the Win Green playhouses – keep away from fire. The fabric is 100% cotton and fully complies with European Standard BS EN 71 Parts 1, 2 & 3. We first saw a large Win Green playhouse at a trade fair. Although it looked quite big in the very large space of the exhibition hall it didn't look anywhere near as big as it did when we put one up in our house! The large Win Green playhouse is 160cm high which is large enough for an average sized adult to stand up in. You may want to measure your space carefully, particularly if you are intending to use the playhouse indoors, as a large playhouse will take up a lot of space. We have generally found that customers who intend to use the playhouse outdoors prefer the large playhouse, whereas those who are looking for a playhouse for a bedroom or playroom prefer the smaller one. What designs are the most popular? 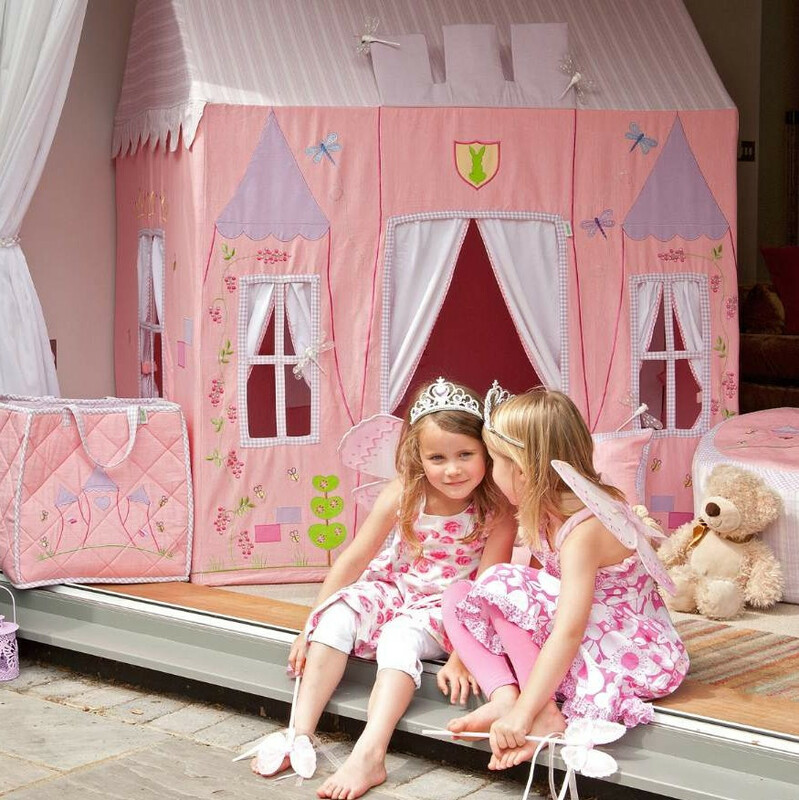 Our best selling playhouses are the Fairy and Butterfly Cottage and the Cowboy Wigwam. 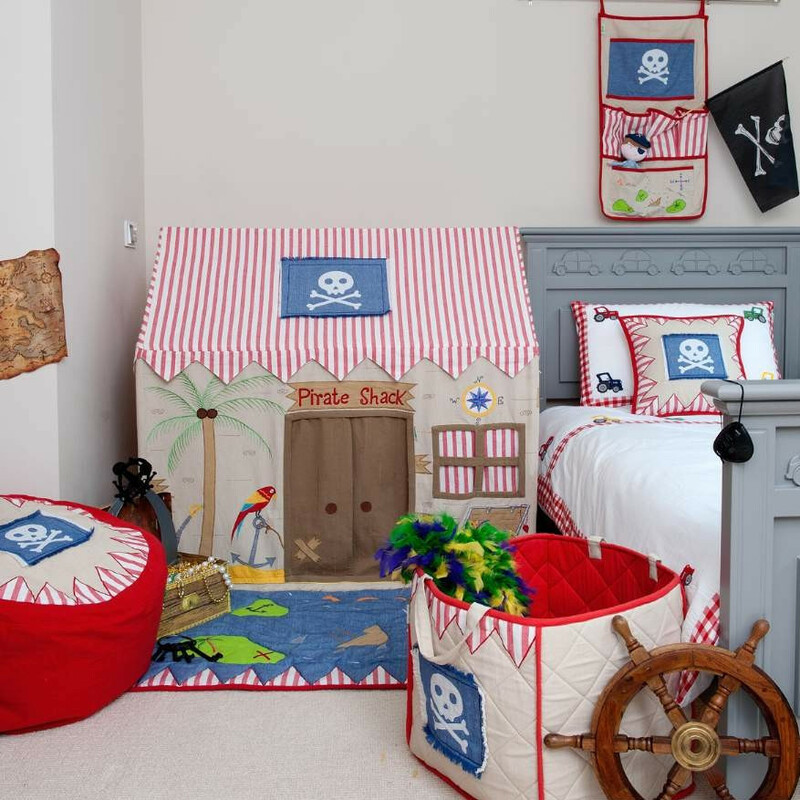 The Toy Shop is also popular with those who are looking for a design to suit boys and girls. 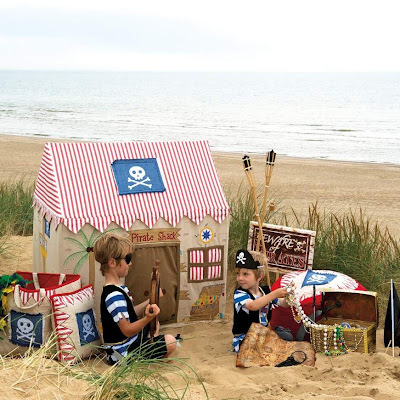 Win Green have recently introduced 2 new designs, a Princess Castle and a Pirate Shack which we also expect to be very popular. How easy is the playhouse to put up? If you are used to simple pop-up playhouses for young children, please be aware that Win Green playhouses are substantially different. The frame consists of metal poles with hard plastic connectors. The fabric is designed to be a close fit over the frame. The first time that you put up the playhouse you are likely to need to gently knock the connectors in place. Once up, the playhouse is a very solid construction. You can of course dismantle the playhouse, however, this will be a longer task than taking down a pop-up playhouse. You will find it easier to put up the large playhouse with 2 people although it is possible to do it with one. Can I get replacement connectors or poles? Yes, we can order a set of connectors or set of poles for you - please contact us. The small playhouse poles are £25, the large playhouse or Wigwam poles are £30. A full set of connectors is £10. If you only have one or two connectors that need replacing and have purchased your playhouse from Dotty Hippo we can provide these free of charge. Connectors do not usually need replacing but very occasionally, particularly when setting up the playhouse for the first few times, a connector may split. The connectors are quite tight initially but loosen up slightly over time.